The Dow Jones averages, bulls and bears, the great crash of 1929, the bull market of the 1980s and 1990s – here is the beating heart of the world’s financial markets, housed in grand neoclassical style at the corner of Wall and Broad streets. 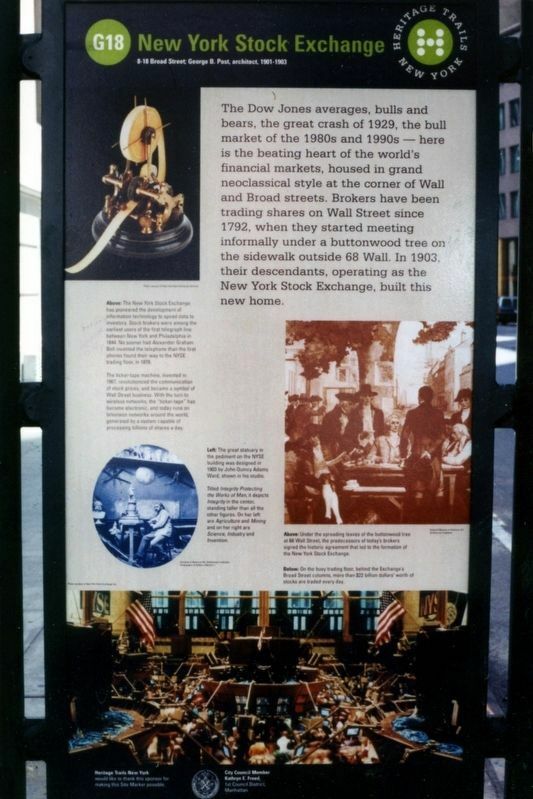 Brokers have been trading shares on Wall Street since 1792, when they started meeting informally under a buttonwood tree on the sidewalk outside 68 Wall. In 1903, their descendants, operating as the New York Stock Exchange, built this new home. 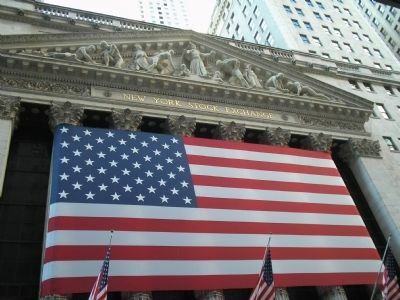 The New York Stock Exchange has pioneered the development of information technology to speed data to investors. Stock brokers were among the earliest users of the first telegraph line between New York and Philadelphia in 1844. No sooner had Alexander Graham Bell invented the telephone than the first phones found their way to the NYSE trading floor, in 1878.
by a system that can process billions of shares a day. Erected by The Alliance for Downtown New York, Inc. Location. 40° 42.4′ N, 74° 0.655′ W. Marker is in New York, New York, in New York County. Marker is on Broad Street, on the left when traveling south. Touch for map. Marker is in this post office area: New York NY 10005, United States of America. Touch for directions. Other nearby markers. At least 8 other markers are within walking distance of this marker. A different marker also named New York Stock Exchange (a few steps from this marker); First Latin School of New Amsterdam (a few steps from this marker); Let Freedom Ring (within shouting distance of this marker); Lord’s Canal (was within shouting distance of this marker but has been reported permanently removed. ); J.P. Morgan Building (within shouting distance of this marker); Wall Street Palisade (within shouting distance of this marker); J. P. Morgan (within shouting distance of this marker); City Hall to U.S.Capitol / Money Men / Nassau Changes Scale (was within shouting distance of this marker but has been reported permanently removed. ). Touch for a list and map of all markers in New York. More about this marker. 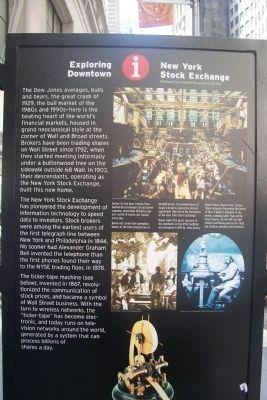 The marker contains pictures of a ticker-tape machine, life on the floor of the Stock Exchange, early stock traders meeting under the buttonwood tree, and John Quincy Adams Ward, designer of the NYSE building, in his studio. Related markers. Click here for a list of markers that are related to this marker. 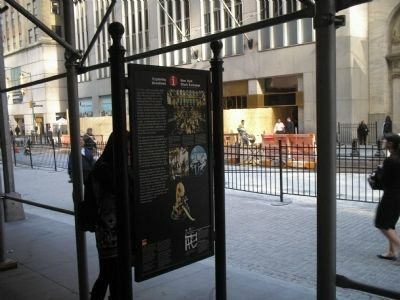 Take a tour of the markers in lower Manhattan erected by the Alliance for Downtown New York, Inc. 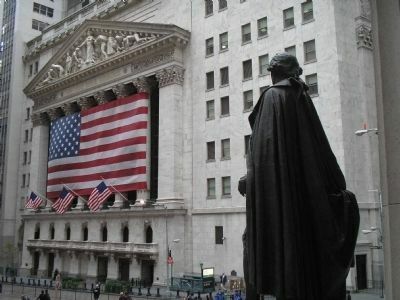 The imposing ediface of the NYSE building was based on a design by famous sculptor John Quincy Adams Ward. New York Stock Exchange as seen from the steps of Federal Hall. John Quincy Adams Ward also scuplted the statue of George Washington seen here. 5. 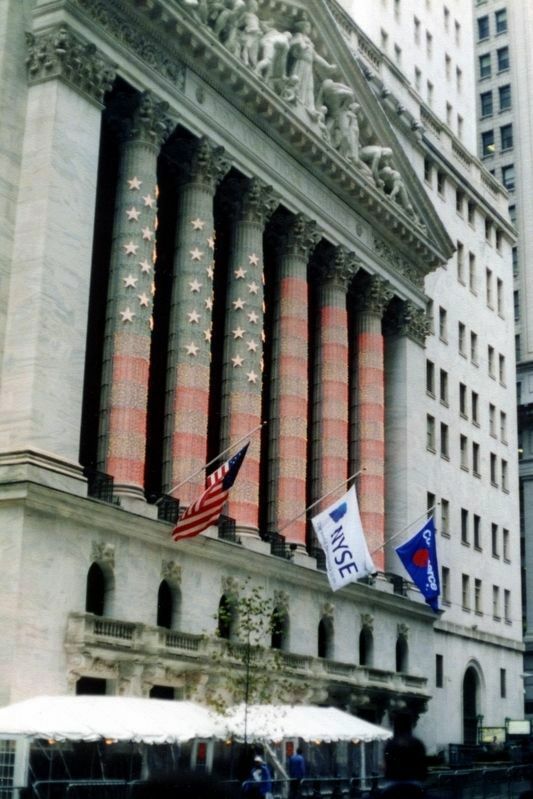 The NYSE, post-9/11 appearance. More. 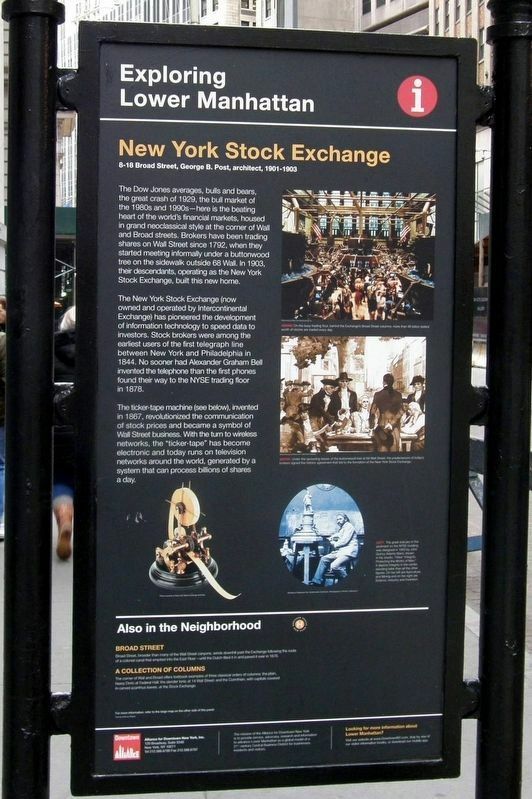 Search the internet for New York Stock Exchange. Credits. This page was last revised on December 22, 2018. This page originally submitted on November 8, 2009, by Bill Coughlin of North Arlington, New Jersey. This page has been viewed 940 times since then and 10 times this year. Photos: 1. submitted on April 30, 2011, by Volker Schmidt of Albstadt, Germany. 2, 3, 4. submitted on November 8, 2009, by Bill Coughlin of North Arlington, New Jersey. 5, 6, 7. submitted on December 22, 2018, by Larry Gertner of New York, New York.